Although there are many doors that will lead visitors into a hospital, there are two primary entrances that are most commonly used at hospitals around the nation. For many patients and family members, the “main” entrance they use first is the door to the Emergency Room. In fact, more than 144,000 people came through the Beech Grove, Indianapolis and Mooresville Emergency Departments in 2009.
soon included a new ER, one that could best accommodate the growing need for services. The ER will be located on the first floor of the new tower, north of the new main entrance near the Heart Center. It will have 55 exam rooms, four trauma rooms, and three behavioral health rooms. Patients can be dropped off at the ER using a drive separate from the one leading to the Heart Center and main entrances. Ambulances will approach the ER via another drive on the north side of the bed tower. According to Randy Todd, M.D., medical director for St. Francis Emergency Services, the two main focuses for planning the ER were efficiency in delivering care and round-the-clock safety of staff members. “Our idea was not to try to predict our needs in five years but to determine a design that would be most flexible in meeting changing needs,” he said. To that end, he and several staff members visited three other hospital ERs in Ohio and North Carolina. Their visits helped the staff and architects develop a design that included a central core near the ambulance entrance that provides patient rooms for the sickest patients and a working area for nurses and unit secretaries. 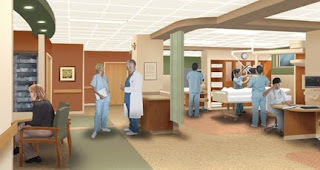 Additional patient rooms are organized in sections, or “pods” of eight beds. Each pod can be used to group patients with similar diagnoses or needs, such as a pod for pediatric patients and one for patients with acute care needs. As the patient population rises and falls during the day, the “size” of the unit changes around the central core. This way, staff is kept close together to improve efficiency and safety and enhance communication between staff members.